Copper coins were not widely used in New France for a large part of its 150-year history. The reason for this apparent anomaly was a distrust of copper coinage that developed early in the commercial life of the colony. From about 1650, as trade was expanding and passing from the hands of the trading companies to individual merchants, the shortage of coins became acute and French coins circulated at a premium. Copper coins in particular commanded a large premium and merchants in the city of Quebec engaged in the profitable activity of importing copper coins from France. Since the merchants paid for these with silver and gold coins, the metallic currency of the colony was temporarily disorganized: for several years virtually thc only coins in circulation were copper. In 1664, however, the colonial government took steps to discourage the import of copper, and copper coins gradually disappeared from circulation. The most common coin of small denomination used in New France was the sol. In the 17th century the sol was a base silver coin about the size of our five-cent piece but in 1719, as a consequence of the great inflation in France, the sol was struck in copper, about the size of our fifty cent piece. When in l720 New France needed coins of small denomination, a large quantity of copper sols was shipped from France. The passage of fifty-six years combined with the familiarity of the sol made these coins readily accepted by the colony. 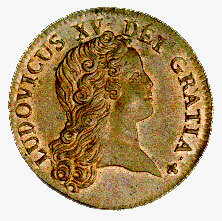 The obverse features a bust of Louis XV as a boy; he had become king only a few years earlier. The coin is part of the Bank of Canada's National Currency Collection.